Dr. Waqar Wadho and Farah Said presented at a seminar on “Stimulating Firm Productivity and Growth” on March 6, 2018. The seminar was jointly organized by International Growth Centre (IGC), Consortium for Development Research (CDPR), State Bank of Pakistan and Institute for Business Administration Karachi (IBA) at the State Bank of Pakistan, Karachi. Seminar attendees included researchers at the State Bank, IBA, LUMS, Federal Board of Revenue, Sindh Board of Investment and K-Electric, among others. 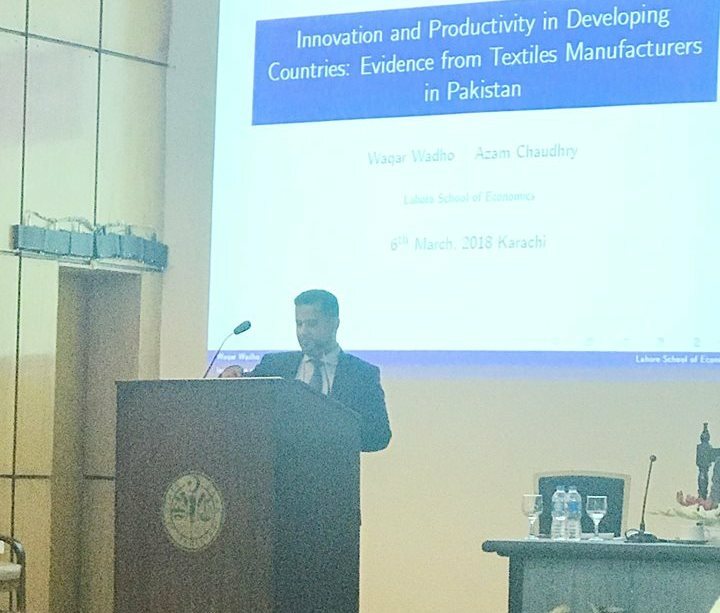 Dr Wadho presented his joint work with Dr Azam Chaudhry, on the innovation in the Textile Sector or Pakistan. Ms. Said presented preliminary results from a behavioral intervention designed to increase access to solar electricity in off-grid areas of Sindh.